Based on Super Mario Bros.
Piranha Plant Slide (known as Piranha Plant Pipeway in the British English version) is the first course of the Star Cup in Mario Kart 7, and second course of the Lightning Cup in Mario Kart 8 and Mario Kart 8 Deluxe. It is based on the underground levels of Super Mario Bros., and appears to take place in a sewer. It consists of floating blocks, two blue Goombas, one Giant Goomba, and, of course, Piranha Plants. Even the music for the track contains parts of the Underground theme. Mario races through the underwater portion. The start of the track begins at a castle and immediately goes into a pipe in the same fashion as in World 1-2 of Super Mario Bros. The track is mainly underground. It has flowing water that can cause the player to speed up when driven on, similar to Koopa Cape from Mario Kart Wii. There is a huge Piranha Plant in the middle of the road which causes the track to split for a bit. After passing the Piranha Plant, two Goombas are encountered. Both are blue, similar to the underground ones in Super Mario Bros. A huge jump right after the Goombas leads the player to regular ground. Players also have the option to jump and drive on the floating bricks and collect the Coins on them before landing on the ground. A few pipes on the ground provide jumps for the player. Soon, the player must go down a huge pipe into a section that is underwater. Some pipes generate currents that allows for players to be blasted to higher ledges. 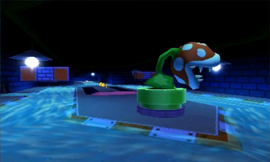 Another Piranha Plant blocks the path causing players to have to maneuver around it, though players can drive above it using the current-producing pipes. Then, players drive up a ramp which takes them above ground to a fortress with three Drain Pipes that the player must avoid. They will land on a grassy area, with walls, trees and bushes heavily resembling the Super Mario Bros. backgrounds. 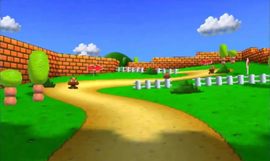 Some Boards shaped like Goombas and bushes are placed in the road, too, and there are gaps in the fences where players can use a Mushroom to cut through the grass before the finish line. Piranha Plant Slide returns in Mario Kart 8 and Mario Kart 8 Deluxe as the second track in the Lightning Cup. The underwater version of the music has been removed. The starting banner, though still castle-themed, has been expanded to resemble the exterior of the larger castles, such as the one found at World 1-3 of Super Mario Bros., with towers added to the expanded walls on the side, replacing the flagpoles. The banner and towers also serve as stands for several Toads and Koopa Paratroopas. The biggest change done to the course is the alteration of the underwater section. The chute that enters the water now goes straight down and is wider, larger, and has three slides, instead of a small spherical hole in the wall. The chute and the underwater section are also now an anti-gravity segment, with the track going down and then curving upward towards the glide ramp through a large tank populated with Cheep Cheeps, rather than through a closed tube. This results in a much steeper glider ramp. The three slides at the start/finish line have a ramp added at the end, allowing racers to perform tricks on them. The Star Cup sign at the entrance to the tunnel has also been removed, due to it being a retro track. In addition, the first of the two grass shortcuts during the last stretch has been removed, likely due to it being easily done without a mushroom via gliding over it in Mario Kart 7. However, gliding over it outside of 200cc is impossible without a Mushroom due to the gliding section being made much steeper. Small Piranha Plants from N64 Royal Raceway have been added throughout the above ground section of the course. The Staff Ghost for this course is Ludwig, as a possible throwback to being the boss of a pipe-themed world. Ever since the Version 4.0 update, players can now glide over the castle gate on 200cc. The staff ghost for this course is Ludwig on the Jet Bike, with a time of 2:21.321. In Mario Kart 8 Deluxe 200cc, the staff ghost is Wendy with a time of 1:48.454. The bushes and clouds that appear on this course share a model, only with different textures and shading. This is a reference to Super Mario Bros., in which bushes and clouds shared the same sprite, albeit recolored. This only applies to the Mario Kart 7 version, as the Mario Kart 8 version uses more realistic clouds and bushes. This page was last edited on April 5, 2019, at 22:25.